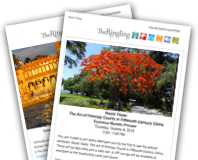 It is one of the loveliest, most fragrant spots on the Ringling estate and one of its very first works of art. Completed in 1913, the 27,225 square foot Rose Garden is Italian inspired, its circular design patterned after a wagon wheel, its pathways lined with garden sculptures of courting couples in pastoral scenes. But when the estate fell into disrepair in the late thirties and early forties, the garden was one of the victim’s. When restoration began, horticulturist Ron Mallory made it his personal mission to return the Rose Garden to its former glory. He recruited volunteers whose work revived the beds, earning the garden accreditation from the All-American Rose Selections in 2004 and recognition in 2006 as the most outstanding All-American Rose Selections Public Rose Garden in the nation. While none of the original roses planted by Mable survive, many of the 1200 rose plants are of the same varieties she planted. Today, the garden consists of roses introduced between 1793 and 2002, among them Tree Roses, Hybrid Teas, Floribundas, Grandifloras, miniature roses, shrubs and Old Garden Roses. Fittingly, a rose dedicated to Mable is also featured in the garden. Please note: During the months of February and October the estate gardeners, with the help of many dedicated volunteers cut-back all of the roses. It usually takes two weeks to complete this work. Upon completion of the cut-back there are very few blooms. A nice flush of new blooms is usually expected approximately six weeks after the cutback. Just north of Ca’ d’Zan is Mable’s Secret Garden, where she, John and his sister Ida Ringling North are buried. Mable created this garden with plants given to her by friends and neighbors during her winters at Ca’ d’Zan. She enjoyed entertaining her guests by taking them on tours. Today, thanks in large part to the efforts of The Driftwood Circle of the Sarasota Garden Club, varieties of Bromeliads, Philliline Violets and Variegated Bougainvilleas thrive. Reminiscent of romantic 18th- and 19th-century German and Italian gardens, the Dwarf Garden is peopled with amusing stone statues that John Ringling had brought from Italy. Though modest and discreet, the statues serve as a symbolic link bonding the visual and performing arts celebrated at the Ringling. Originally installed by the Museum’s second director, Kenneth Donohue, the Dwarf Garden sat between the north wing of the Museum of Art and the free standing building that housed The Historic Asolo Theater from 1958 to 2004. When the Theater was later moved into the Visitor Pavilion, the Dwarf Garden was relocated next to the Visitor Pavilion, where it continues to delight visitors. Mable envisioned an estate riot with exotic trees and plants and collected them with the same passion that her husband collected art. To wander the estate today is to wander through a 66-acre garden of trees, among them 14 Banyan, the largest collection in Florida; two Shaving Brush; one Tiger Claw; one Monkey Puzzle; two Ear, including the state champion, the largest in Florida; two Rainbow Eucalyptus; and six varieties of bamboo. Thanks to a generous donation from David F. Bolger, a bayfront promenade was developed in 2010, which connects Ca’ d’Zan to the Millennium Tree Trail at the southern end of the estate. Created to mark the year 2000, the trail provides a welcome respite from the intense Florida sun, and showcases a wide variety of trees, including oak, holly, citrus and magnolia. Marrying perfectly with the Renaissance-style of the Museum of Art, the Courtyard embodies the ideals of the Renaissance garden. U-shaped, it has long loggias flanking a central courtyard that features bronze and stone copies of famous Classical, Renaissance, and Baroque sculptures, among them, at its heart, Michelangelo’s David. The courtyard consists of three, tiered terraces with turf, low-growing juniper and slash pines. The west end of the courtyard is home to a moat flanked by statues of reclining figures representing the Nile and Tiber, the great rivers of Egypt and Rome. The grace of the gardens’ shapes, the power of their size, their bursts of color create the sense that the estate itself is a canvas, the Ringlings work of art. And as you stroll across this canvas and hear the whisper of the bay breezes blowing sweet through the branches and watch the sun set a rainbow over the Gulf you can almost see John and Mable standing at the edge of the water, hand-in-hand smiling at the legacy they left behind.